For daily printing jobs, the HP 8453 performs brilliantly. At some stage your HP 8453 will run out of printer ink, and when it happens you'll soon discover that ordering HP 8453 ink may be really pricey. But you do not need to be anxious about shelling out the steep costs you'll uncover on the high street because here at Cartridge Save you can find all the HP 8453 cartridges you will need at tiny prices. Save cash on your ink by buying online at Cartridge Save! It makes no sense to fork out so much for the 8453 original cartridge or 8453 compatible ink in the main street when it is far more easy to save a wadge of cash buying with Cartridge Save. You can have perfect peace of mind by purchasing your PhotoSmart 8453 ink cartridges from us seeing as everything is underwritten by a cast iron money back guarantee. Bear in mind that each order has free delivery, normally arriving at your door next day! Print vibrant photos easily with the HP Photosmart 8453. This printer also produces professional documents and supports wireless printing via Bluetooth. Network ready and efficient, it is a good value solution for average printing requirements. The sleek HP Photosmart 8453 has a user-friendly control panel and delivers excellent print quality. It has a monthly duty cycle of 3000 pages and an optional automatic duplexer to decrease paper waste. It comes with of 2 standard paper trays, but can be upgraded with 2 more. It is possible to print even without a computer, direct from HP Photosmart 8453's five memory card slots, which accept 11 card formats. It has a USB port and a PictBridge for direct printing from cameras. The HP Photosmart 8453 boasts smart printing features, including a cancel button, a low-ink indicator, and paper-type and format detection. We like the HP Photosmart 8453's LCD screen, where users can edit photos right before printing, thereby reducing errors. The trouble with the HP Photosmart 8453 is it is a bit slow. The fastest printing speed is 20 ppm. 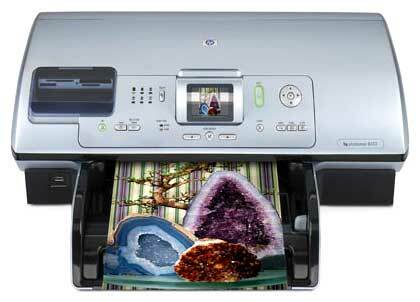 It is not Wi-Fi ready and the HP Photosmart 8453 uses 6 inks, driving running costs up. Expect pricey inks and toners, and be prepared to change them more often than usual.